New innovations in mailboxes include sports team mailboxes for sports enthusiasts to sport their favorite team on their mailboxes. Times are changing and with these changing times come opportunities for everyone to choose mailboxes to suit their lifestyle! While we once considered the love of sports to be more of a man’s activity, many women today are joining their husbands and significant others in the love of the sport, so they can both display their love on their mailbox. Now, not only can the mailman deliver your mail but he or she can also see what team you support. Some of the ways you can choose to display your team include just an emblem on an ordinary mailbox or you can choose a mailbox more in the design of the team, such as a cardinal to represent the Cardinals team or a mailbox in the shape of an eagle to represent the Eagles. While there is nothing wrong or obsolete about choosing an ordinary functional mailbox, many people like to use their mailboxes to portray a piece of their personality. Sports team mailboxes have the capability to do this very thing. While you can expect to pay more for specialty mailboxes, you will also be happier because of the pride you can exert into the display. For example, some people choose to purchase special mailbox designs for Christmas, Easter, Halloween and other special events. Just keep in mind if you just purchase the emblems, you can bring them out when you choose to do so, easily. 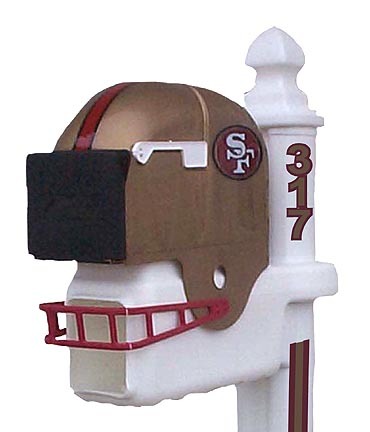 Even if you purchase a mailbox in the shape of an Eagle or other sports team emblem, you can alternate it with your ordinary mailbox as you see fit. Do not feel you have to do the same thing everyone else in your neighborhood does. The best part of having your own home is so you can dare to be different! As long as you stay within the regulations the United States Post Office defines, you can do what you want with your mailbox. No, you can’t change the shape of it without permission. But, you can choose designs already approved.